This site discusses and shares thoughts and experiences in SQL Server. 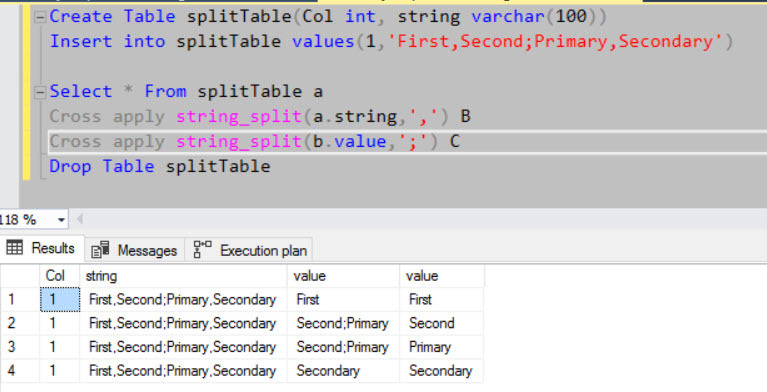 SQL Server 2016 has introduced a built-in table valued function string_split to split a string into rows based on the separator. Earlier, developers need to write custom/user defined function to do the split work. However, with the new function, its a built-in and can be used directly. The problem with user defined function is the way the function is defined and used.There are multiple ways usually developers write custom functions like scalar/Table valued functions. And its observed in many cases, scalar functions are not scaling as desired and causing serious performance issues. If we analyse the execution plan of the above query, we can see “Table Valued Function” operator is used to implement the function. 1. ONLY a single-character delimiters can be used at a time. If you want to apply multiple delimiter, you can use multiple CROSS APPLY. 2. There is no way to understand the ordinal position/eliminate duplicates/empty strings in the string. 3. This function will work ONLY if the compatibility of your database is 130 or later irrespective of SQL Server version. I would recommend to use this built-in function for future development and provide your experience as part of learning and sharing. My name is Latheesh NK. This is my personal weblog. The opinions expressed here represent my own and not those of my employer. For accuracy and official reference refer to MSDN/ TechNet. I have documented my personal experience on this blog.